I’ve been missing from my blog. And I’ve been really missing my blog! Last spring I worked hard to be diligent about posting regularly but somehow life has caught up with me. I guess it happens sometimes. The reality is that I am just one person. And this one person has an awful lot on her plate! Since getting engaged, M and I have bought a house, moved, started redecorating and home improvement projects, participated in our dear friends’ wedding and have been working hard at planning our own wedding. On top of that we both have full time jobs that keep us really busy! I have been so upset that my blogging (and really, my cooking) has taken a back seat to everything else going on in my life. So what’s the remedy? A martini. Yep, time for a delicious guilt-free cocktail! The fabulous folks over at Gourmet Garden sent me a whole slew of their fresh herbs to experiment with and what did I do? I mixed them with alcohol. I’ve been mesmerized by this craft cocktail craze going on lately (is this nationwide or just a Cali thing?) but I’m always concerned about the amount of sugar and calories in them. Enter this herby concoction with just the right amount of kick to tingle your lips. I’ve been a fan of Gourmet Garden for a long time. Long before I conceived of this blog. 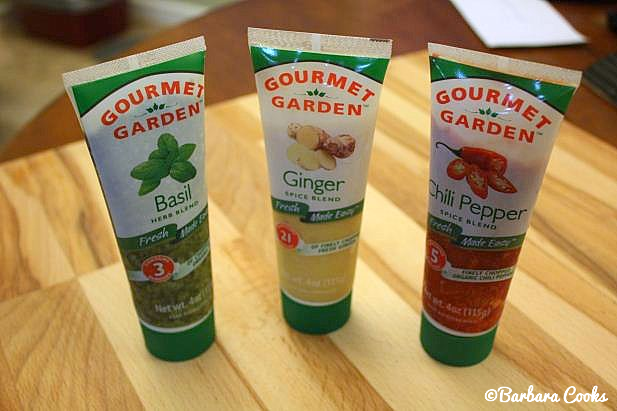 They make a whole variety of prepared fresh herbs in tubes that are ready when you need them. This saves a ton of time mincing all those herbs for your pasta sauce or soup and saves you money because you won’t be throwing out herbs you can’t seem to finish up in time. I can’t tell you how many times I haven’t been able to eat up that bunch of cilantro or dill before it goes slimy on me. Sometimes there is no replacement for a truly fresh herb, but this definitely comes as close as you can get! 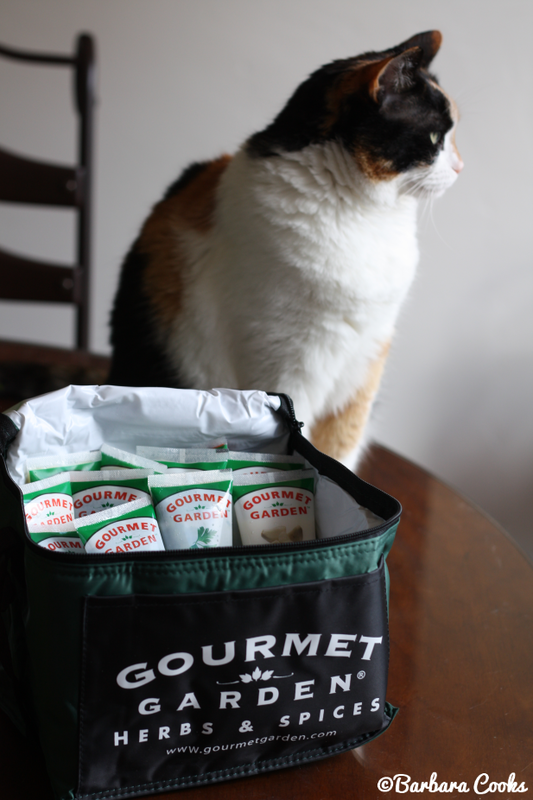 Roxy posing with the Gourmet Garden stash – She loves anything green! Check out all their delicious flavors here. For this cocktail, I used ginger, chili and basil. I had some fresh mint on hand that I had to use up so I pureed it and mixed it with the Gourmet Garden herbs. Trust me, it would have been a lot simpler and less messy had I used the Gourmet Garden mint too! I paired the mixture with fruity herby gin and rimmed the glass with cayenne sugar. 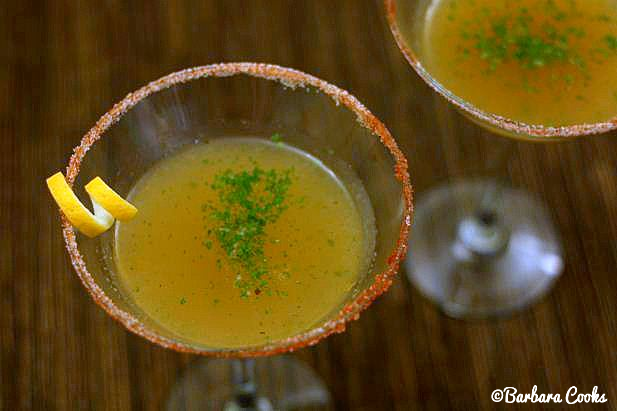 The drink is delightfully savory and the cayenne sugar rim gives it a hint of heat and sweet. Next up? 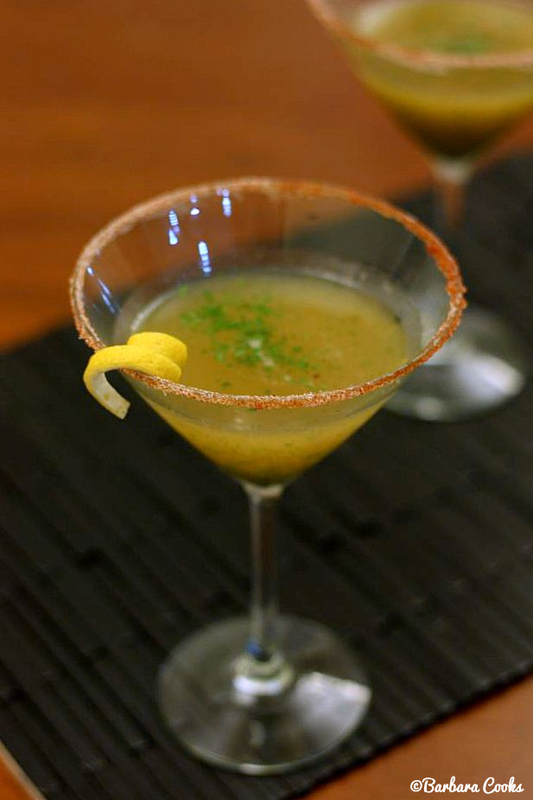 Basil and Balsamic Vodka Martini. Mmmm! Combine the granulated sugar and cayenne pepper. 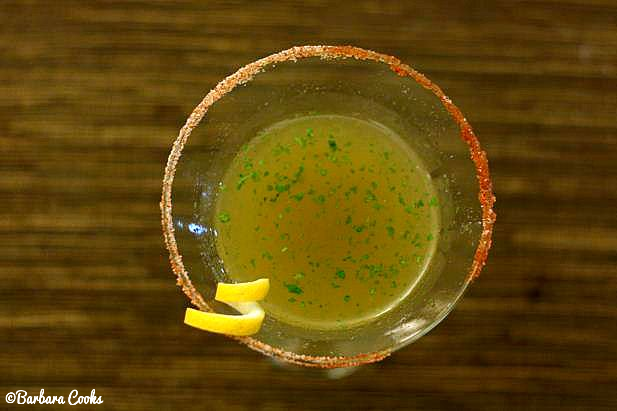 Rub the lemon along the rim of a martini glass and coat the rim with the sugar mixture. Stir together the Gourmet Garden herbs and superfine sugar in a small bowl. Fill a cocktail shaker with ice. Pour in the gin and the herb mixture. Shake vigorously. 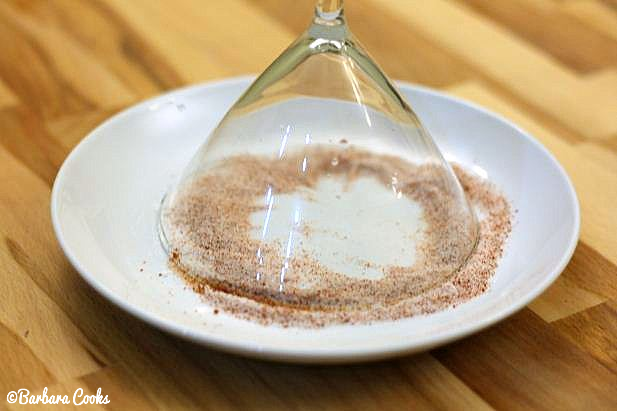 Pour into two martini glasses rimmed with cayenne sugar. Garnish with lemon peel*. *HINT: use the peel from the lemon slice to make the garnish. Remove the flesh, cut the peel in half and twist into a coil with your fingers. Hold for a few seconds to help it keep its shape. This recipe not only sounds delicious, but looks beautiful too! You’ve truly outdone yourself Barbara Cooks! Can’t wait to make this new guilt-free drink for my hubby and I on our date night! As always, thanks for being so creative and thoughtful, so the rest of us don’t have to! Shawn, I too am a sucker for anything Thai. Well, any kind of Asian food really! Such comforting flavors. I have a friend who actually calls me her “Secret Asian” because I love it so much! I LOVE using Gourmet Garden. It does not beat the flavor and intensity of fresh herbs, but it is the best substitute out there. Christina, my sentiments exactly. Maybe their slogan should be “Next Best to Fresh”! Thanks, Valentina! Things are pretty crazy right now and it’s a bit of a test of my scheduling ability. I need to learn to prioritize for myself. I always do much better with a deadline and a schedule which I’m working on. It’s sometimes difficult to concentrate when I’m still living among boxes, though – hehe! This looks super delicious. There is nothing better than a sweet AND savory cocktail. Thanks, Erin! So many cocktails are sweet, but i do tend to prefer the savory myself. I love Gourmet Garden myself – I use their garlic and dill all the time, but really like the lemongrass! Well, Jennie. I was a bartender at one point in my life. But I won’t say I’m a mixologist. I really admire those who can make tasty libations from interesting combos!